TOKYO – In the summer of 2007, addressing the Central Hall of the Indian Parliament as Japan’s prime minister, I spoke of the “Confluence of the Two Seas” – a phrase that I drew from the title of a book written by the Mughal prince Dara Shikoh in 1655 – to the applause and stomping approval of the assembled lawmakers. In the five years since then, I have become even more strongly convinced that what I said was correct. Peace, stability, and freedom of navigation in the Pacific Ocean are inseparable from peace, stability, and freedom of navigation in the Indian Ocean. Developments affecting each are more closely connected than ever. Japan, as one of the oldest sea-faring democracies in Asia, should play a greater role in preserving the common good in both regions. Yet, increasingly, the South China Sea seems set to become a “Lake Beijing,” which analysts say will be to China what the Sea of Okhotsk was to Soviet Russia: a sea deep enough for the People’s Liberation Army’s navy to base their nuclear-powered attack submarines, capable of launching missiles with nuclear warheads. Soon, the PLA Navy’s newly built aircraft carrier will be a common sight – more than sufficient to scare China’s neighbors. That is why Japan must not yield to the Chinese government’s daily exercises in coercion around the Senkaku Islands in the East China Sea. True, only Chinese law-enforcement vessels with light weaponry, not PLA Navy ships, have entered Japan’s contiguous and territorial waters. But this “gentler” touch should fool no one. By making these boats’ presence appear ordinary, China seeks to establish its jurisdiction in the waters surrounding the islands as a fait accompli. If Japan were to yield, the South China Sea would become even more fortified. Freedom of navigation, vital for trading countries such as Japan and South Korea, would be seriously hindered. The naval assets of the United States, in addition to those of Japan, would find it difficult to enter the entire area, though the majority of the two China seas is international water. Anxious that such a development could arise, I spoke in India of the need for the Indian and Japanese governments to join together to shoulder more responsibility as guardians of navigational freedom across the Pacific and Indian oceans. I must confess that I failed to anticipate that China’s naval and territorial expansion would advance at the pace that it has since 2007. The ongoing disputes in the East China Sea and the South China Sea mean that Japan’s top foreign-policy priority must be to expand the country’s strategic horizons. Japan is a mature maritime democracy, and its choice of close partners should reflect that fact. I envisage a strategy whereby Australia, India, Japan, and the US state of Hawaii form a diamond to safeguard the maritime commons stretching from the Indian Ocean region to the western Pacific. 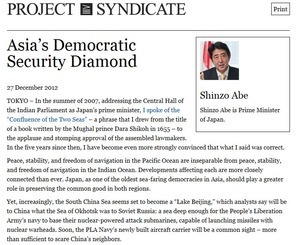 I am prepared to invest, to the greatest possible extent, Japan’s capabilities in this security diamond. My opponents in the Democratic Party of Japan deserve credit for continuing along the path that I laid out in 2007; that is to say, they have sought to strengthen ties with Australia and India. Of the two countries, India – a resident power in East Asia, with the Andaman and Nicobar Islands sitting at the western end of the Strait of Malacca (through which some 40% of world trade passes) – deserves greater emphasis. Japan is now engaged in regular bilateral service-to-service military dialogues with India, and has embarked on official trilateral talks that include the US. And India’s government has shown its political savvy by forging an agreement to provide Japan with rare earth minerals – a vital component in many manufacturing processes – after China chose to use its supplies of rare earths as a diplomatic stick. I would also invite Britain and France to stage a comeback in terms of participating in strengthening Asia’s security. The sea-faring democracies in Japan’s part of the world would be much better off with their renewed presence. The United Kingdom still finds value in the Five Power Defense Arrangements with Malaysia, Singapore, Australia, and New Zealand. I want Japan to join this group, gather annually for talks with its members, and participate with them in small-sized military drills. Meanwhile, France’s Pacific Fleet in Tahiti operates on a minimal budget but could well punch above its weight. That said, nothing is more important for Japan than to reinvest in its alliance with the US. In a period of American strategic rebalancing toward the Asia-Pacific region, the US needs Japan as much as Japan needs the US. Immediately after Japan’s earthquake, tsunami, and nuclear disaster in 2011, the US military provided for Japan the largest peacetime humanitarian relief operation ever mounted – powerful evidence that the 60-year bond that the treaty allies have nurtured is real. Deprived of its time-honored ties with America, Japan could play only a reduced regional and global role. I, for one, admit that Japan’s relationship with its biggest neighbor, China, is vital to the well-being of many Japanese. Yet, to improve Sino-Japanese relations, Japan must first anchor its ties on the other side of the Pacific; for, at the end of the day, Japan’s diplomacy must always be rooted in democracy, the rule of law, and respect for human rights. These universal values have guided Japan’s postwar development. I firmly believe that, in 2013 and beyond, the Asia-Pacific region’s future prosperity should rest on them as well. Shinzo Abe is Prime Minister of Japan and President of the Liberal Democratic Party. He wrote this article in mid November, before Japan’s elections.